Posted on February 25, 2015 by Elizabeth E.
No, wait. This was QuiltCon. What was interesting was meeting people that had been 2D to me, through correspondence and jpeg images, and having them become 3D persons. I think that was my favorite part of QuiltCon, and as you know, the one keeping me up at night before I went. As Leisa and I (lowerest left photo) walked into the Convention Center to register, the first person we met was Susan Katz from Southern California (photo just to the right of that). Then in the lowerest right photo, I met TaosSunflower. She was in line ahead of me and I put the description she’d given me in a 2D world together with the elegant, tall woman that I glimpsed, and asked her name. We left Flatland together and smiled and hugged and talked. I met her nearly every morning for breakfast, as she was staying in my hotel, and feel like I’ve deepened the friendship that we’d established through our correspondence. It was she who asked me one morning if I was almost through my “Flat Stanley phase.” I laughed out loud, for it was a perfect description of what I’d been doing. The thing is that people whose books I’ve purchased, people I’ve been reading, people whose blogs I’ve commented on and whose bees I’ve joined were all so accessible. I’d never ask Alex Anderson or Ricky Tims (two traditional quilters) for a dual selfie, but I walked right up to Malka Dubrawsky and Heather Ross and asked them for one. . . and they happily smiled and posed. I met other 2D quilters, and we again left Flatland as we figured out that we read each other on blogs, or knew of each other on Istagram. 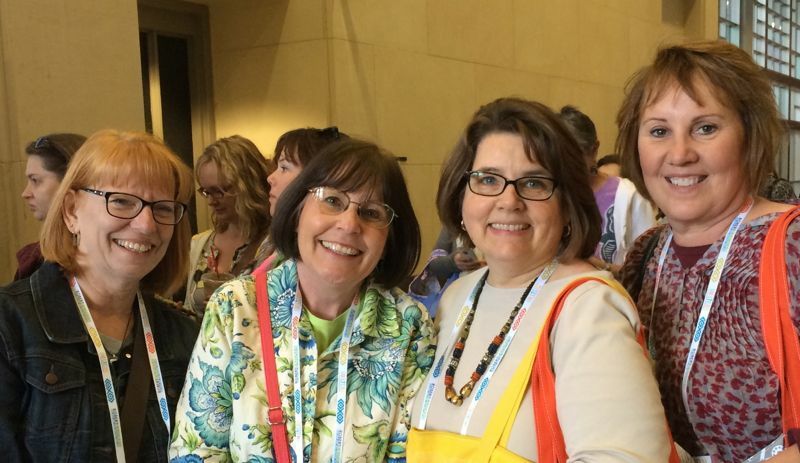 Here are Cindy (LiveaColorfulLife), Anne (SpringLeaf Studios), me and Leisa. The two tall women in the back are Nicole (MamaLovesQuilts) and Ginny (Minnowpeck). They are who I’d invited to lunch, along with the cute short quilter in the back, Christa (ChristaQuilts). I’d met Heidi (front left) in class on that first day, and I already knew Cindy (center). That luncheon swelled to ten happy quilters. And. . . this was QuiltCon. I hadn’t seen many of the quilts from the 2013 version, and was curious at what was there, what was deemed to be “modern,” since no one really knows, or could seemingly articulate. I was happily surprised. I think we’ve all conquered the deconstructed Log Cabin or Square in a Square, as there were several of those, so it’s probably time to move on from that block. And I glimpsed another faction within this faction, shown in the photo above, as the modern-traditionalists are on one side of the floor, and the modern-moderns are on the other. I’ve been putting the photos of the quilts up on my Instagram (button to the right), blowing up my children’s feeds in the process, and still have quite a few to post. But I wanted them up there for others who were in my position last time–so they could see the quilts that made it in. To be truthful, there were a few I would pull out and put in some of those QuiltCon rejects. (You know I’ll write about them in the days to come.) But for the most part, I was happy to see such fine quilts of such high quality. This felt different than a “regular” quilt show, as there were many vendor booths with things to do, such as the Cotton and Steel Booth, above, where I sewed a patchworky square (okay–I confess–it was a wonky Log Cabin). They also had many “Demos”: half hour (or shorter) talks from Famous Quilters. Sometimes it was an out-and-out pitch for a product, but other times they talked about their process or their designs. I enjoyed my classes, trying to find at least one thing that was new to me, and I really loved the lectures, proudly letting Bill Volkening know (he, of 1970s quilt-collection fame), that I made my first quilt in 1973, out of sheets, calicos and a poly-cotton blend solid. I still have that quilt (and perhaps moderns would like to know that even though I pressed the seams to one side, all the seams are now flat flat flat after so many years). I laughed and smiled through the Luke Haynes lecture (where someone really did ask him how often he changed his needle), and was fascinated by what Bill Kerr had to say about noticing details. I met Claire, another digital pen-pal of mine and regretted terribly that I didn’t get a selfie of us together. Next time, Claire. Maybe even in Pasadena in 2016? 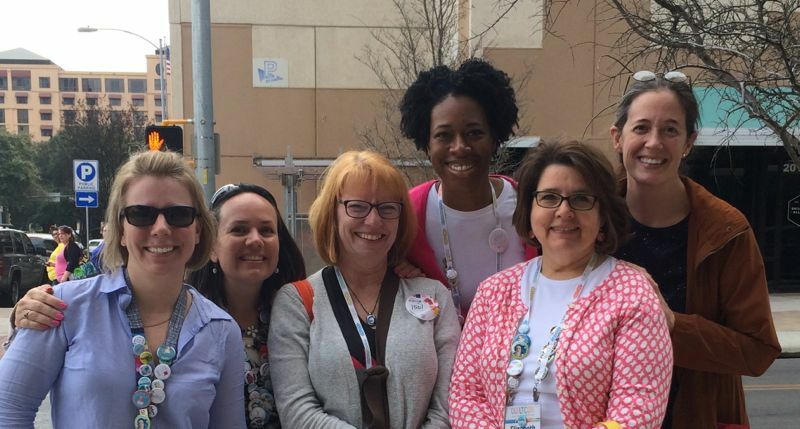 I realize that I may have participated in something that cannot ever be duplicated, as they are now splitting the convention into two geographical halves: Pasadena in 2016 and Savannah in 2017. And I’m a bit saddened by that. 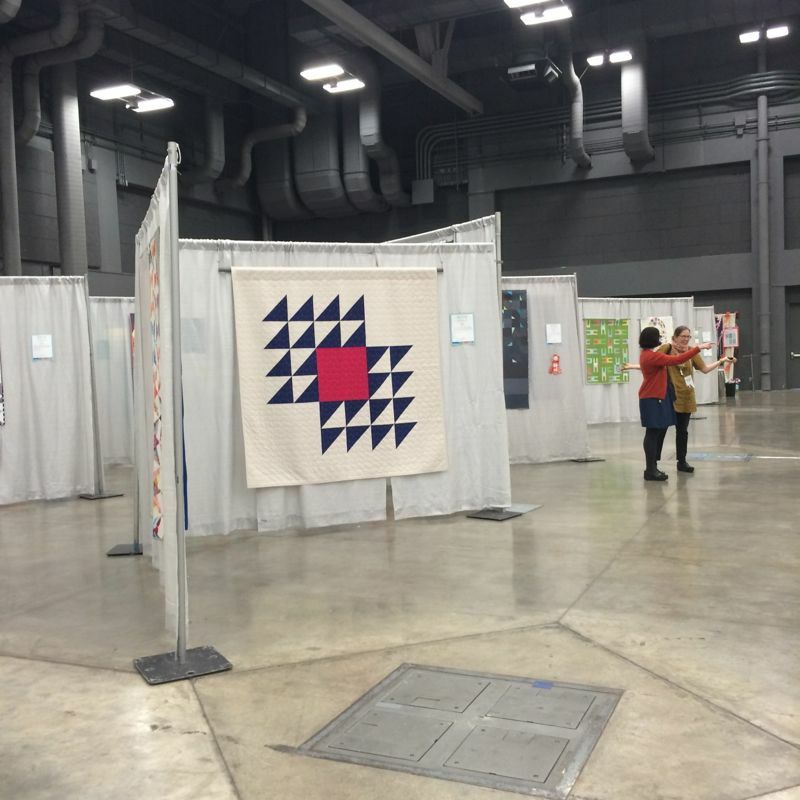 Austin is pretty darn perfect for this sort of thing, with good hotels with close proximity to the convention center, delicious food in the restaurants (we never ate the same place twice), terrific vendors and superb lighting for all the quilts. But it was the mix of quilters and Famous People who were happy to talk to you and visit with you that made it so enjoyable. I am looking forward to the West Coast version of QuiltCon in Pasadena, and maybe I’ll see more of you there. Bring your buttons, and let’s trade. Let’s leave Flatland together! Thank You for such a wonderful post…I’m sad to have missed out! Sounds like a wonderful event (and possibly better than the first one!) 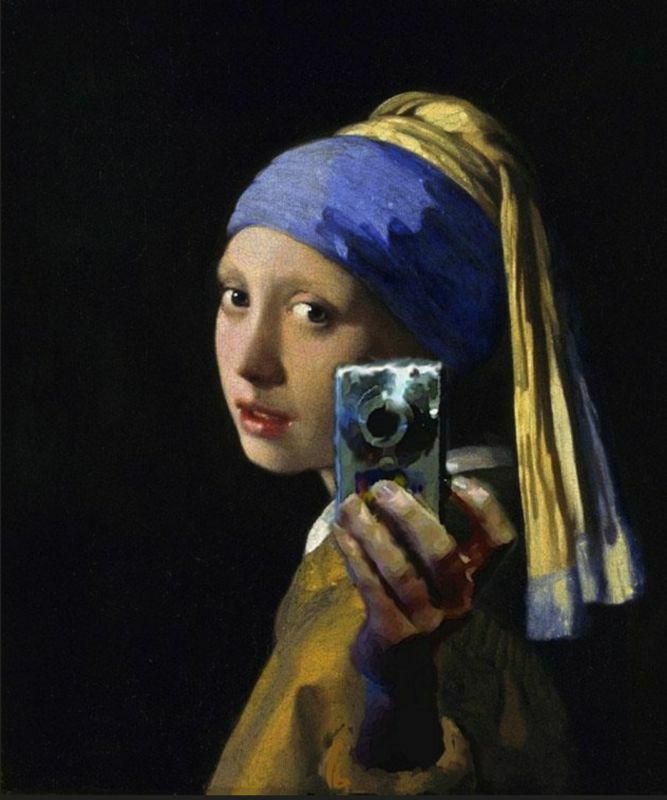 and I’m so happy to see Lizzy House in one of your selfies (have missed her)! Now off to check out Instagram. What is the reference to Flatland all about? It looks like a wonderful time. I am excited about it being in Pasadena as that is much closer to home! I’d love to come out of Flatland. It was great to meet you in person, and next time we need to make a good plan to spend more time together. I don’t think that QuiltCon will actually split people, there are no other big shows, at least so far, where my people go. I think I’ve told our “talking at the back of the class” moment about a dozen times. Talk about instant flatland to 3D! Best hugs ever from all the Flat Quilters that I bumped into!!! Had a great time and am wondering about the splitting of the U.S. myself. Really interesting to read and thank you again for all the posts on IG of the quilts. It was interesting to see that there did seem to be an absence of the use of lots and lots of prints in the quilts, favouring instead solids. I wonder when that will change when you consider many of the fabric designers at QuiltCon (AMH in particular) are known for their beautifully colourful,prints. What a perfect review of QuiltCon, Elizabeth! You put the whole experience into words much more succinctly than I managed to do! 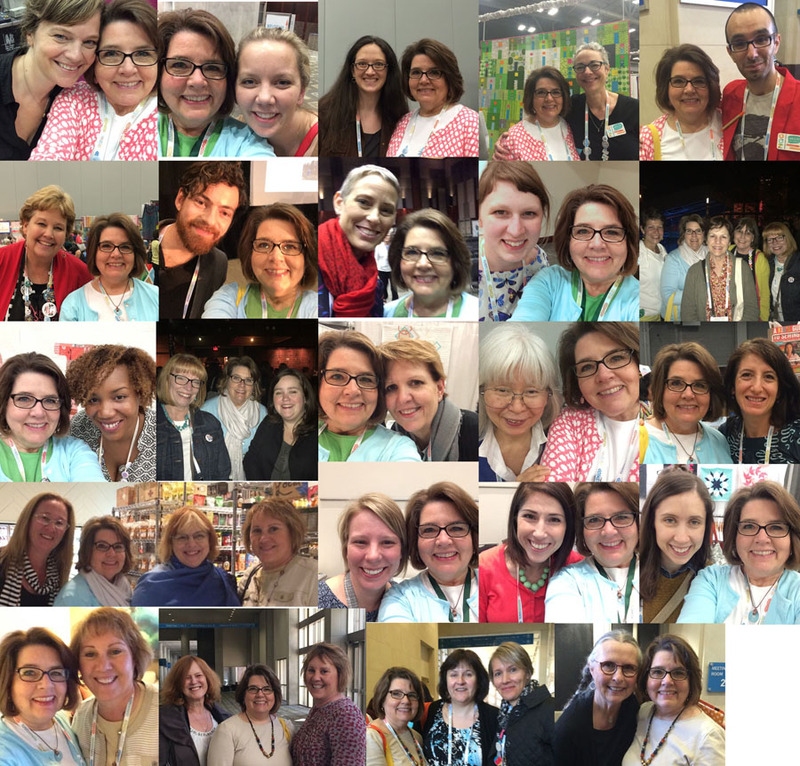 Love your photo collage with all the great quilters you had a chance to meet. And you definitely had more fun eating opportunities being in downtown Austin! I best like the photo of you at the sewing machine. 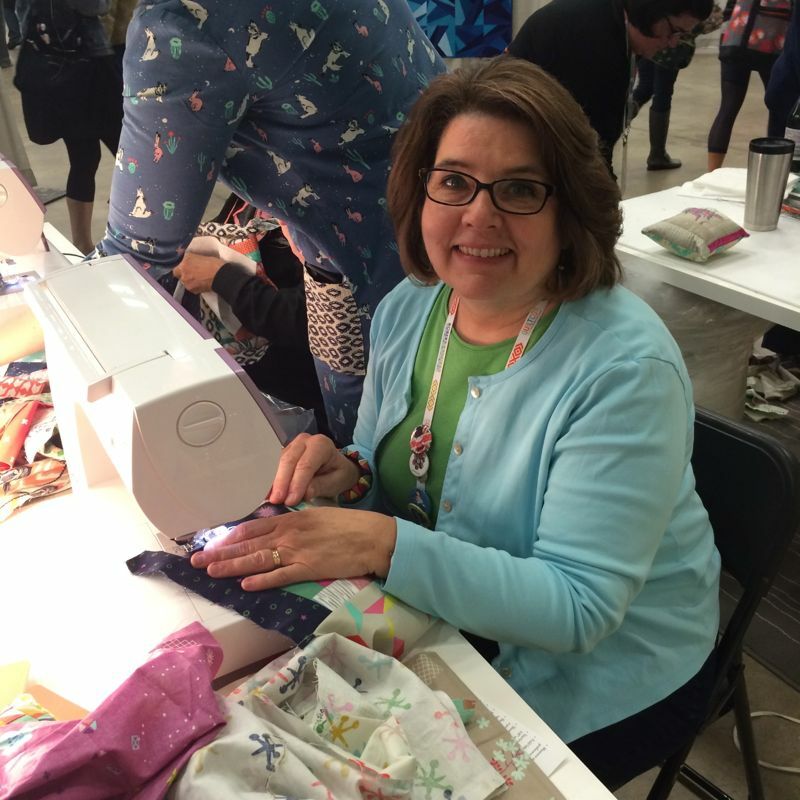 It’s a most perfect representation of what QuiltCon is about – a happy quilter. You’re the best! I’m tickled that we met! Love reading all these after posts. It was the BEST meeting you in person and Leisa too. She’s a sweetie. I’m really really not the flake I seemed. Really. Just too overwhelmed by it all. Now I want to spend more private time with you, Cindy, Linda and the rest of the MCM members so we can actually talk without the chaos. Maybe a MCM retreat is in order sometime. I guess I am still a Flatlander (its what we call our cycling group too!!) Hopefully i will make it there one day….It is a shame it is in February- too close to the start of our school year! Maybe a MCM retreat may be a better way of, one day, meeting up! What a FUN post!! I hope we meet someday! I have been reading your blog for a while but I had never commented, but I could do relate to your experience of meeting people face-to-face (I of the 2D – 3D you are using!). I don’t get to go to many quilting events, and in my professional life I have for many years worked geographically apart from colleagues. Online relationships are great, but there is just something special about meeting in person! My friend Annemarie and I have probably only met on 4 occasions but our online connection has turned into a friendship through that. Thanks for sharing, Elizabeth, I hope you get to meet many more of your 2D friends in 3D! It was so nice to meet you!! Hope to see you next time! I see out button! Yeah!